Customers vying for trendy and contemporary fashion can now find them at affordable prices with Banana Republic Malaysia sale offers and Banana Republic deals. Simply click on the ‘Sale’ tab for access to the latest Banana Republic sale merchandise. 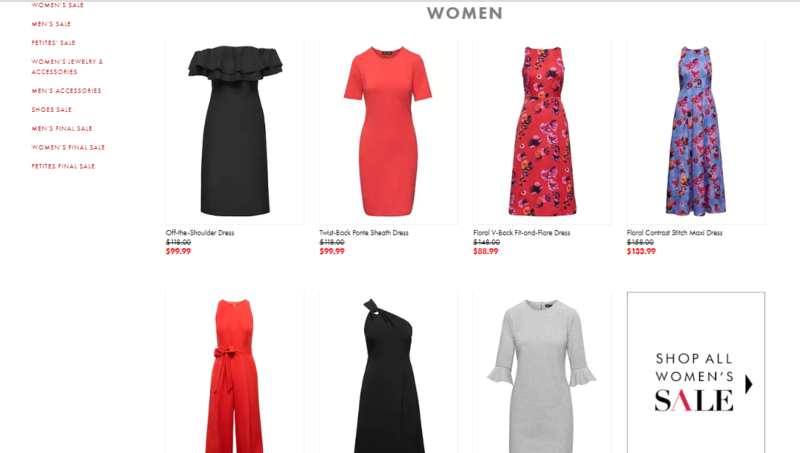 You can also check out premium clothing at affordable prices online by checking out the Banana Republic factory selection. The company also runs several promotions for their new and current customers. They may provide a discount on merchandise or free shipping on an order and usually have an expiration date. Before using any promotion, be sure to check its terms and conditions for specific guidelines and restrictions. Most of Banana Republic’s promotions cannot be combined with other offers or discounts. Unique codes: Used for promotions offered to current customers via email, the postal service, or in person. These Banana Republic promo codes are composed of a combination of 12 letters and numbers (for example, "PWFXYPFGC2DD"). Unique codes are usually found under or near a barcode, or in a designated area of the message or coupon. Generic codes: Used for promotions available to new and returning customers, via email, in stores, on the websites, or on Facebook or Twitter. Generic codes can be any number of letters or numbers, but often represent the promotion itself (for example, "FREESHIP" or "TAKE30OFF"). Category promotions, which don't require the use of a Banana Republic code. These promotions are offered to anyone who shops on the websites for a specific item or category of items (for example, "adult jeans" or "Kids and Baby") or during a specific period (for example, "Labor Day"). The discounted price appears with the item description. Banana Republic offers versatile, contemporary classics, designed for today with style that endures. Through thoughtful design, the brand creates clothing and accessories with detailed craftsmanship in luxurious materials. They aim to dress men and women who see every day as full of possibilities and seek to make the most of every moment and opportunity. With their classic styles and contemporary designs, the brand can now be found online and in more than 750 Banana Republic outlet locations worldwide. On November 28, 1978, Banana Republic opened in Mill Valley, Calif. – right across the Golden Gate Bridge from San Francisco – as a shop for people with a passion for safari and expedition wear from faraway places. Their founders were two progressive entrepreneurs who embodied the pioneering spirit of San Francisco. They loved to travel to collect the surplus clothing that outfitted the store. In addition to the Mill Valley store, Banana Republic offered a unique, award-winning travel-oriented catalogue referred to as a travelogue – to appeal to the “journeyman” in everyone. In 1983, San Francisco-based Gap Inc. saw something special in Banana Republic and brought it into the Gap Inc. family, with a promise to keep its unique spirit alive. Today, Banana Republic is a global apparel and accessories brand focused on delivering versatile, contemporary classics. Whether it is the store in the United States or Banana Republic Singapore, across the world individuals can be seen wearing fashionable clothing by this brand. From Banana Republic t-shirts and Banana Republic dresses to accessories like the Banana Republic perfume, this brand has cool and contemporary fashion for everyone. Here, we look at the product categories available on the site. To shop at Banana Republic online, simply follow the steps given below. Step 1: On the homepage, browse the category and then select the subcategory to locate your product. You can also use the search bar to find a specific product. Step 2: Click on the product you like best for important information and product details. If you would like to buy the product, choose your colour, quantity and size (if applicable) and click on ‘Add to Bag.’ You will be able to see a confirmation for the same as a pop-up on your screen. Step 3: If you want to add more products to your cart, you can continue shopping. To buy the products click on the cart icon at the top-right corner of your page and click on the ‘Checkout’ button. In case you have a Banana Republic coupon code or Banana Republic discount coupon, don’t forget to enter it in the box provided to claim your Banana Republic discount. Step 4: At this stage you will be requested to enter your account details, or you can even continue as a guest. Enter your delivery and billing details in the next form. From there, you will be redirected to the payment page. Enter your payment details and within 24 hours, you will receive an order confirmation email, which shows the order number and provides a link to your order status page on the website. You can check the status of your order anytime by clicking the "Orders and returns" link in the top right corner of the website. Note: Some cards and payment methods may not be eligible for international transactions. Step 1: Visit the ShopBack website and click on the Banana Republic store at the bottom of the homepage. You can also use the search box to find the link to the store. Step 3: Look for the latest Banana Republic discount code or Banana Republic promo code in the Banana Republic coupon codes, voucher codes, discount codes and promos section. Step 4: You will be redirected to the Banana Republic website to browse and select the items. Your international purchase is managed and made secure by Banana Republic’s partner vendor Borderfree, a technology company that helps U.S. retailers carry out transactions with consumers in more than 90 countries. After you've completed your purchase on the website, Banana Republic will ship your item or items to the Borderfree shipping hub in the United States. Borderfree then ships your order to its international destination. The maximum order value for international shipment is USD $25,000 (excluding all duties and taxes). During checkout, Borderfree calculates and guarantees your order's international shipping costs. The costs are calculated based on a number of factors, including the number of purchased items, the weight of the items, and the postal code of the destination country. Most items arrive 11-24 business days after receipt of your order. A shipping timeline specific to your destination can be viewed as part of the checkout process. Shipping windows are estimates and delivery dates cannot be guaranteed. · The email address you used during the checkout process. Open the email that confirmed your order has shipped and click the "Track Package" link. Or you can also go to the Borderfree Order Tracking website to use the tracking tool. If you can't find it on the Borderfree homepage, click the Orders link on that page. Contact the company within 30 minutes of your order, and Banana Republic will do everything they can to accommodate your request. Note that the company’s automated processes fill orders extremely quickly, so the time window for changes or cancellations is very short. Note that if you cancel an item purchased with a promotion or special deal like a Banana Republic voucher, you may not be eligible to receive that promotion or discount again. You can return an item received in an international order, but exchanges are not possible at this time. Instead, you can return the unwanted item and order a new replacement separately. Refunds include duties, taxes, and tariffs. Unfortunately, Banana Republic cannot refund your original international shipping charges. Returned items must be sent to Borderfree with a Return Merchandise Authorization form. You can contact Banana Republic to request a Return Merchandise Authorization form. Note that returns sent without this authorization form may not be accepted. You will then receive an email with the authorization attached for your signature, as well as instructions on packing and sending the items you want to return. The email also shows the amount of your refund. As soon as Banana Republic receives your package, Borderfree refunds the cost of the returned merchandise to your original method of payment, such as the credit card used for the order. You also receive an email to confirm that the return has been completed. If the refund is applied to your credit card, your credit card company may take up to 10 additional business days to post the refund to your account. For additional assistance or queries, you can connect with the Banana Republic customer care team via the following methods.